In my kitchen this past week I’ve managed to burn my Thanksgiving brussels sprouts, make a bum batch of chocolate brownies, crack my favorite coffee mug and somehow spill a half bottle of red wine under…UNDER my refrigerator. Additionally, since my kitchen seems to be a vortex of ill fate, I’ve refused to do the dishes. It wasn’t a pretty sight, friends. I was just about due for an intervention. I was just about ready to throw a stick of dynamite into my kitchen and hope for the best. Instead I opted for one last shot… mostly because sticks of dynamite like the ones they have in cartoons are hard to find… maybe I’m just looking in the wrong places… whatever the case, I preheated the oven, kept my head down, and… success! Sweet, dense, chocolate and peanut butter success. This dark kitchen cloud seems to have passed, and I’ve managed to get all of my dishes in the dishwasher…. things are looking up and tasting pretty darn good too. These peanut butter blondies are serious. The blondie is dense and packed with brown sugar and peanut butter flavor. The chocolate frosting is the perfect compliment, although if you simply wanted to add chocolate chips or broken up Reese’s Peanut Butter cups to the blondie batter, that would be just as delicious. 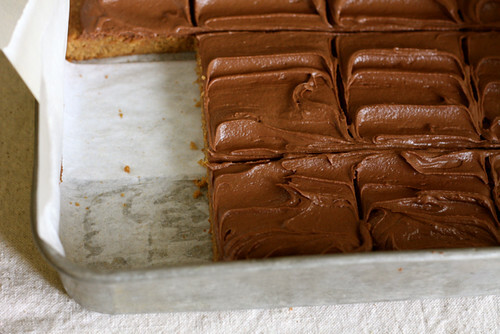 I think frosting on brownies is the ultimate indulgence…. so why not go for it. Be warned… you’ll need milk to drink with these. Lots of milk. Preheat oven to 325 degrees F. Grease a 9×13-inch pan, line with parchment paper if you have it on hand, then grease the parchment paper. 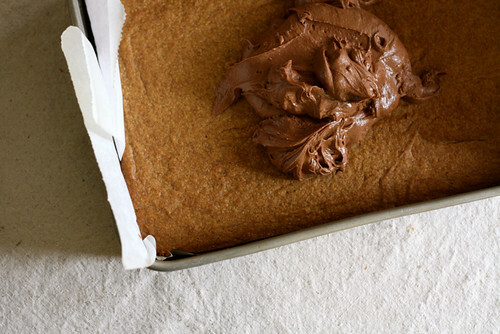 If you don’t have parchment paper, these blondies will be just fine. In the bowl of a stand mixer, beat together the butter, cocoa powder and salt. Add 1/2 cup powdered sugar followed by 1 tablespoon milk. Beat well. Add another cup of powdered sugar, followed by 2 tablespoons of milk. Melt milk chocolate chips in the microwave or in a double boiler. Add melted and slightly cooked milk chocolate the frosting and beat to incorporate. Add the final 1/2 cup of powdered sugar if you need a bit more thickness. Spread evenly over peanut butter blondies. I really like the wood piece you’ve been using in photos recently. Oh my- These look spectacular! My list of baked goods to make grows longer by the day. I’ll never get through them all and a good hunk of that lis is all your fault, Joy :P! What’s better than peanut butter and chocolate!? I bet some Texas Pecan Coffee would make a good chaser too. Chocolate and Peanut Butter are probably the two best combinations ever brought together in the kitchen. Those look fantastically delicious! Oh the things i’ve spilled that have crusted over under my fridge. Don’t sweat it Joy! 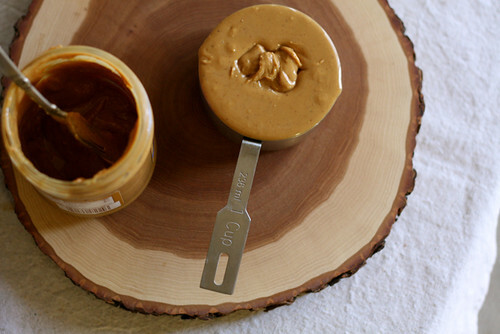 That peanut butter measured out in the cup looks pretty good on its own. Great frosting job! So I totally had one of those days in kitchen this week. I made a batch of Carmel Apple Sticky Buns. First attempt at ’em. Boy were they a bomb. I empathize with you. I wnt to bake something now that will turn out successful to rid myself of my latest kitchen woes. Somehow I will have to wait because finals/studying/projects are calling my name. Bleh. Can I be your neighbor/friend/sister/mom? And then relish in the thought of sharing a plate of these with you? Simply…mmm. I might have to put these on my Christmas wish list. They look delicious! BTW, today I made my very first rolled pie crust and I used your recipe from the November ’08 Apple Pie. No more Pillsbury for me! You can see a really bad picture of what turned out to be a really tasty pie on my blog! I love peanut butter anything. I like that this recipe is for a 9×13 pan, which is a much better size for my book club and parties than the 8×8 pans that most recipes call for. Can’t wait to try it out! omg delicious! what classifies “blondies” as blondies? These look perfect. 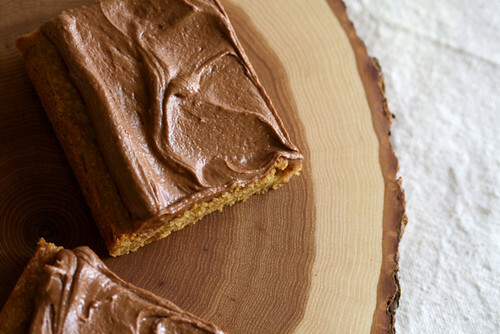 I have been searching for a milk chocolate frosting recipe, and have just found it!